Great lunch hook destination and so much more so close to home for so many! Just off the banks of the great city of Greenwich is a delightful destination perfect for a daysail and ideal for an overnight on a calm summer night. There are actually three islands (Great Captain, Little Captain and Wee Captain) that make up this natural barrier to Greenwich Harbor and environs. 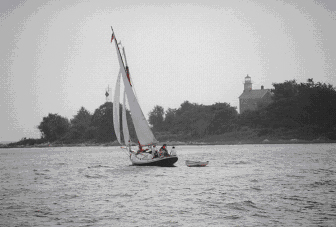 It’s just the right distance for a day sail from many western Long Island Sound ports and provides ample anchorage for a lunch visit and a refreshing dip or a fishing foray, as well as an overnight. Most of the boats that come out during the day leave at dusk, especially the power vessels, so it tends to be rather active on beautiful days and peaceful after dark. The holding ground is good but it offers protection only from the S-SW so it’s best when the conditions are fair and when it’s desirable to catch a bit of breeze in the heat of the summer. In the Fall, you can find solitude. View of the anchorage from the beach. Navigation here can be hazardous so it’s best to consult a chart and follow the navigation aids carefully. Many of the rocks cannot be seen at high tide, but luckily the channels are well marked. For the same reason, the area offers excellent fishing. We’ve been there when the sea came alive boiling with blue fish as far as the eye could see just waiting to give the prepared angler a thrill. The anchorage just inside Cormorant Reef in an idyllic spot, providing a terrific view of the old lighthouse and a lovely beach, which unfortunately is off limits to all but Greenwich residents, who need a permit to take advantage of it. The lighthouse is not open to the public. There are restroom and camping facilities available by permit to residents as well. A ferry disgorges visitors to the islands at regular intervals so it is advisable to anchor away from the ferry dock at the northwestern end of the island. It too is restricted to town residents so the only way to see the lighthouse and the island is by private boat. Beachcoming after a storm yields treasure in this nature preserve...oysters and other creatures looking for a way back to the sea. The island has been preserved mostly in its natural state. There is a nature preserve in the middle of the island that is host to many species of birds. There are times when you can lose count of the multitudes of heron, osprey, ducks and geese. The island has a system of hiking trails which, although short, provide breathtaking vistas of the sound, the rocky shoreline, and the nature preserve. There is also a second anchorage just off Calves Island, the former Y camp, now owned and managed by the US Fisheries and Wildlife Service as a nature preserve, although plans are underway to restore the old facilities and add an Olympic swimming pool. The water is deep almost all the way to shore and afford moderate protection from a northerly swell. Sun setting over Calves Island as a catboat comes in for the night. It’s always fun to take a side trip along the shoreline to view the stately homes on the banks and wonder who is watching from within. We don’t often go into town because the anchorage is a good 1.5-2 miles from the waterfront and it’s easier to drive there from Rye , but we expect to do some shore leave there this year. We’ve heard the Bruce Museum is worth a visit and there’s a great new Provencal waterfront restaurant, l’Escale, in the Delamar Hotel on Greenwich Harbor . Certainly a great reason to make a long overdue visit ashore. 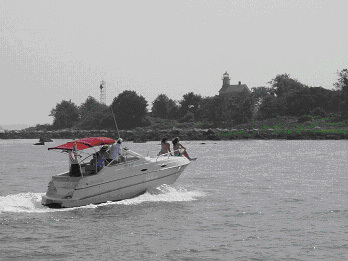 The lovely Indian Harbor Yacht Club is right at the heart of access to town. The town has several facilities with slips and moorings available to smaller vessels. Come back this summer and read the update or better yet, send us your story of visiting Greenwich by water. Many of the powerboats are day trippers. Grass Island Marina in Greenwich Harbor has tie-up space for visitors. There is no charge during the day and a nominal overnight charge. Call the boating office at Town Hall, (203) 618-7651 for further information. Anchorage and "Lunch Hook" mooring areas are available at a number of locations throughout town. Please call Eric Omdahl in the Harbormaster's Office for more specific information. He can be reached at (203) 622-6474.